Over the past few months, Apartment 238 at Vinson Hall Retirement Community (VHRC) has been transformed into an “Innovative Model of Living,” an apartment that looks and behaves more like an upscale hotel room than your typical retirement unit. It is the tangible result of an idea that senior living spaces – given the right form, bold design, aesthetics and new technology -- can continue to be highly functional and safe, but provide a major improvement over traditional spaces. 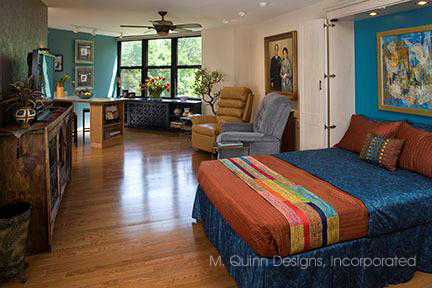 The Innovative Model of Living (IML) is a collaborative effort between VHRC and design expert Moira Leite of M. Quinn Designs. Leite, with her “Beautiful Accessibility” concepts, brought to the project many years of professional experience in planning, designing and retrofitting homes to meet the functional needs of her clients while applying elegant decorating techniques. All features of the IML are designed to be as cost effective as possible. Almost nothing is custom made; rather its components are available through retail channels that anyone can access. Leite bought some of the materials at local discount stores and even one or two items on Craigslist. The space features nine different colors of lighting – both fluorescent and incandescent - each one specially chosen for its location and its ability to illuminate areas that might be difficult for people with vision impairments to discern. The IML features a “channeling kitchen,” that enables a resident to move food – such as a heavy pot -- to all areas without having to lift it. Colors were chosen to ensure that transitions from one part of the unit to another were easily distinguished by someone with visual impairment. All refrigerator controls are in the front of the unit. Only four models of refrigerators are sold in that configuration. It also features a larger interior space than normal. The room features two power-lift easy chairs that can be raised electronically to enable a person with disabilities to get up from the chair easily. A remote-control garbage can opens with a wave of the hand.